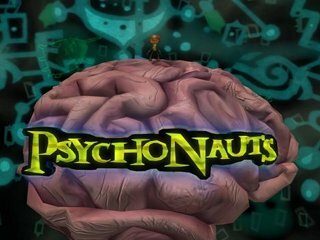 Released in April 2005, Psychonauts is a platform video game created by Tim Schafer. The story focuses on a young boy named Razputin (or, "Raz") gifted with psychic abilities, who runs away from his circus to sneak into the awesomest summer camp in history - one that teaches how to harness latent psychic abilities and utilize them fully. Soon after arriving, he finds out a sinister game is afoot, and he has to explore some of the weirdest minds in existence in order to stop the plot. The game failed commercially, but thanks to sharp writing, good gameplay and an amazing sense of humor, it remains a cult classic. Best time: Single-segment 0:50:11 by 'Grimdonuts' on 2014-01-15. Small hiccups in movement all over the run. Bad luck against the Super Censor. A little bad RNG at Linda auto scroller section. And a couple mistakes near edgar trying to reach the loading zone. Mistakes aside...There is a lot that can go wrong in single segment for this game, overall I am quite happy with the end result of this one. Final time is 54:16. Timing starts at file name confirmation at the bunk and time ends at the death of the final boss. For tricks and explanations on what is used in this run I will gladly refer you to SMK's amazing knowledge base on psychonauts! It covers everything currently used. And before we get started I would like to thank SMK, lookw, Inexistence, Butt3rs, Bloodisblue, Abahbob, AdiftSC, and Mrfleshlight for making this run what is it today. At the start I head towards the outhouse picking up one arrowhead on the way to the trampoline. I bounce up from the trampoline getting me to my first psi challenge marker, using a small shortcut, by hopping on a tiny ledge and double jumping from there. I double jump off the platform with the psi challenge marker and bunny hop off the roof I land on. This gets me on the ramp leading up to Coach Oleander's Basic Braining. After finishing Basic Braining head over to the main lodge. After talking to Ford I head to the left grabbing an arrowhead on the way and jumping on the pole nearby. Once I'm at the top I jump towards the roof and pickup another psi challenge marker. From here you can just bunny hop off the roof into the lake or do a psi palm induced jump as shown in this run. Once at the lake I grind on the left railing and jump off to land under the boardwalk. Picking up an arrowhead and double jumping back up to the boardwalk to avoid a cutscene. Heading towards the GPC cave I pick up two arrowheads before entering the GPC area. From the GPC cave I collect an arrowhead near a tree by the crow feather then turning to the right to collect two on the hillside. Heading up this hill I jump around the tree to get up to the rocks with the pirate scope meanwhile collecting the arrowheads up there as well. I drop down and collect another arrowhead just below the rocks [easy to miss]. Jumping over to an adjacent rock to grab that one as well. Just below it is another one to pick up before running towards the little river. After skipping the cutscene near the river I jump to the left of a tree to collect two more arrowheads before heading over to Dogen and Elka. At there feet is another arrowhead I collect before heading to the Isolation chamber. Under the isolation chamber is the last arrowhead I grab.This puts me at 44 arrowheads before heading into Sasha's Lab. Once inside I grab the fossil. However there is nothing special about the Brain Tumbler. I just collect the last 6 arrowheads I need and try to grab as many figments as I can. Brain Tumbler figments are indeed worth more. Skipping ahead to the point that I finish Mila's dance party. This is where I begin collection for the scavenger hunt. I fly over to the psi challenge marker on the big rock near the lake. Jumping off of it I collect the comic and head to the underground tram. Once I am outside the main lodge I grab the doubloon and head inside. Picking up the voodoo doll and the dousing rod from the store. From the main lodge I do a quick jump downhill towards the eagle claw before heading to the campfire area. In the campfire area I collect the dinosaur bone, another psi challenge marker, and the condor egg in that order before heading to the GPC area once again. In the GPC area I head for Ranger Cruller and get my free levels. I jump to the left on the levitation ball to land inside the house next to him to grab the psi challenge marker there before heading back to Nein's lab. Skipping a little further into the run. After I complete Milkman I head over to Gloria and enter her mind. At this point Raz should be level 20 and have at least 800 arrowheads from the section with Linda. I use bacon and go back to get pyrokinesis and telekinesis. When done with all of the training I head over to the main lodge for the cobweb duster at the store. Now we have all we need to beat the game.